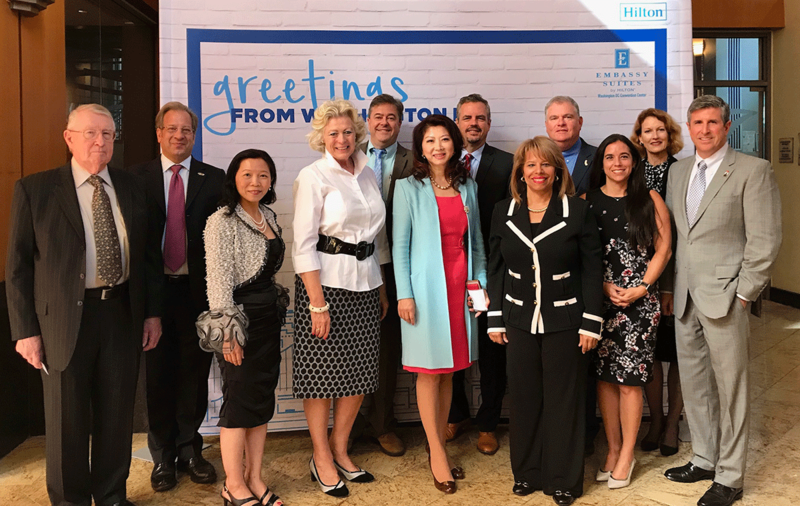 The District Export Councils (DEC) contribute leadership and international trade expertise to complement the U.S. Commercial Service’s export promotion efforts through counseling businesses on the exporting process and conducting trade education and community outreach. The DEC members are appointed by the Secretary of Commerce. These international trade professionals use their knowledge and international business experience to act as consultants to small and medium sized businesses who want to export their products into markets outside of the United States. For more than 40 years, DECs have served the United States by assisting companies in their local communities export, thus promoting our country’s economic growth and creating new and higher-paying jobs for their communities. Central California DEC – Fresno, Inyo, Kern, Kings, Madera, Mariposa, Merced, Mono, San Luis Obispo, Stanislaus, Tulare, Tuolumne, and surrounding areas. The National Association of District Export Councils and the 60 District Export Councils throughout the United States are composed of over 1,300 international business executives and trade experts with extensive business, government and academic experience in trade. The mission of these councils is to work with the U.S. Commerce Department on export promotion and commercial diplomacy. The 1,300 council members around the country are all appointed by the Secretary of the U.S. Department of Commerce. The National Association of District Export Councils (National DEC) consists of 16 District Export Council (DEC) members who have been elected to the National Association of DECs by DEC members from each of the eight U.S. Commercial Service Networks. The mission of the National Association of DECs is to provide support and guidance for fulfillment of the mission of the DECs, and to facilitate communication between the DECs, between the DECs and the U.S. Department of Commerce, and between the DECs and the international business community and policymakers. National Association of District Export Councils, Inc. is a non-profit corporation that maintains a 501(c)(6) federal income tax status. From left: The Hon. David Haubert – Mayor of Dublin, CA; Rod Hirsch, Director, Oakland EAC, US Department of Commerce; Ian Steff, Deputy Assistant Secretary of Manufacturing, US Department of Commerce; Susanne Stirling, VP International Affairs, CalChamber; David Socher, David R. Socher Attorney at Law; John Lee, President, SW Logistics Inc.
Members of the California District Export Councils in Washington, D.C. on October 2, 2018. (From left) Ken Rosenberg, senior vice president and manager international banking, Bridge Bank/NorCal DEC; Rod Hirsch, director, Oakland Export Assistance Center (EAC), U.S. Department of Commerce; Candace Chen, founder, Goddess Cosmetics/Southern California DEC; Susanne T. Stirling, vice president, international affairs, CalChamber/NADEC and NorCal DEC; Nick Grooters, director of international sales, Pacer Technology/Inland Empire DEC; Betty Tang, Inland Empire DEC; Cary Wanner, senior vice president, City National Bank/ Inland Empire DEC; Teresa Cox, senior procurement manager, SonicWall/NorCal DEC; Tim Kelley, president and CEO, Imperial Valley Economic Development Corporation/Imperial Valley DEC; Paola Avila, director of Mexico Business Center, San Diego Chamber of Commerce/San Diego and Imperial DEC; Julie Anne Hennessy, Los Angeles EAC, U.S. Department of Commerce; and Mark Ballam, managing director, College of Business Administration, San Diego State University/NADEC and San Diego and Imperial DEC.
(May 23, 2018) Members of the five California District Export Councils (DEC) met at the California Chamber of Commerce in Sacramento on May 23, 2018 to hear from the Honorable Dale Tasharski, Acting Deputy Director General of the US Department of Commerce and Laura Barmby, U.S. Department of Commerce Liaison to the National Association of DECs. The current issues facing the trade community and the Department were the focus of discussion. Following, the group attended other international-trade related events. Front Row (from left): The Honorable Jerry Levine, Consulate General of Barbados/National DEC, Former Chair; Toby Levine, San Francisco Port Advisory; Mark Ballam, SDSU College of Business Administration/San Diego and Imperial DEC; Cary Wanner, City National Bank/Inland Empire DEC, Vice Chair; Laura Barmby, U.S. Department of Commerce/National DEC; The Honorable Dale Tasharski, Acting Deputy Director General, U.S. Department of Commerce; Susanne Stirling, CalChamber/NorCalDEC and National DEC; Roy Paulson, Paulson Manufacturing Corp/Inland Empire and National DEC, Former Chair; David Haubert, Mayor of Dublin/NorCalDEC: Deep SenGupta, DSG Global/NorCalDEC and National DEC; and Michael Parr, Wente Family Estates/NorCal DEC.
Middle Row (from left): George Tastard, U.S. Department of Commerce; Sung Wook Lee, SW Logistics Inc/NorCal DEC; Candy Hansen Gage, Gage Ag Consulting/NorCal DEC; Everett Golden, Otis McAllister/NorCal DEC; Richard Swanson, U.S. Department of Commerce; Jeremy Potash, California-Asia Business Council/NorCal DEC; Dean Fealk, DLA Piper/NorCal DEC; Carol Johnson, Middlebury Institute of International Studies at Monterey/NorCal DEC; Bob Spence, Inter Asia Pacific/Inland Empire DEC; Janice Whitaker, Teledyne/NorCal DEC; Christel Vilogron, Import Export Best Practices, SoCalDEC; Joanne Vilet, U.S. Department of Commerce. Back Row (from left): Glen Roberts, U.S. Department of Commerce; Julie Anne Hennessy, U.S. Department of Commerce; Adithya Padala, UmeVoice Inc./NorCal DEC; Tsvi (Chuck) Guy, Vecron Exim/Central CA DEC,; Dr. Rudy Besikof, Mt. San Jacinto College/Inland Empire DEC; John McPeak, Biomarin/NorCal DEC; Anthony Hall, Premier Packaging Group/Central CA DEC; Rod Hirsch, U.S. Department of Commerce; David Fiscus, U.S. Department of Commerce; Tom Neff, RINA Accountancy Corp/NorCal DEC; and Pat Cassidy, U.S. Department of Commerce. 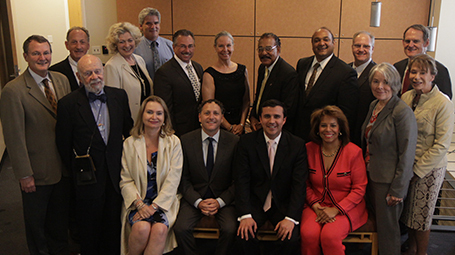 (May 31, 2017) Appointed by the US Secretary of Commerce, the members of the four California District Export Councils (DECs) – NorCal, SoCal, Inland Empire and San Diego – met at the California Chamber of Commerce in Sacramento on May 31, 2017 to hear from Robert Brown, Esq., Chair of the National DEC and Tom McGinty, National Director of the U.S. Commercial Service of the US Department of Commerce. The current issues facing the trade community and the Department were the focus of discussion. Following, the group attended other international-trade related events. Front Row (from left): The Honorable Jerry Levine, Consul General of Barbados/National DEC, Former Chair; Toby Levine, San Francisco Port Advisory; Cary Wanner, City National Bank/Inland Empire DEC, Chair; Don Sovie, Law Offices of Donald E. Sovie/Southern CA DEC, Chair; Robert Brown, Bingham Greenebaum Doll LLP/National DEC, Chair; Susanne Stirling, CalChamber/NorCalDEC and National DEC; Roy Paulson, Paulson Manufacturing Corp/Inland Empire and National DEC, Former Chair; Tom McGinty, National Director, U.S. Commercial Service, U.S. Department of Commerce; Deep SenGupta, DSG Global/NorCalDEC Chair and National DEC. Middle Row (from left): George Tastard, U.S. Department of Commerce; Julie Anne Hennessey, U.S. Department of Commerce; Jeremy Potash, California-Asia Business Council/NorCal DEC; Dean Fealk, DLA Piper/NorCal DEC; Teresa Cox, Techworkers/NorCal DEC; Jamal Qureshi, JQ American Corporation/NorCal DEC; David Fiscus, U.S. Department of Commerce; Rod Hirsch, U.S. Department of Commerce; Tony Hill, U.S. Department of Commerce. Back Row (from left): Richard Swanson, U.S. Department of Commerce; Glen Roberts, U.S. Department of Commerce; Greg Johnston, Dolby Laboratories/NorCal DEC; John McPeak, Biomarin/NorCal DEC; Nick Grooters, Super Glue Corp/Inland Empire DEC, Vice Chair; Everett Golden, Otis McAllister/NorCal DEC; Brooks Ohlson, Center for International Trade and Development/NorCal DEC; Sean Randolph, Bay Area Council/NorCal DEC; Jason Sproule, U.S. Department of Commerce; Matt Anderson, U.S. Department of Commerce. (May 2, 2017) The California Chamber of Commerce joined 40 trade specialists from across the nation last week at sessions focused on trade policy when the National District Export Council met at the U.S. Chamber of Commerce for its annual Spring Legislative Summit. Read more here. From left: David Thomas, vice president, Business Roundtable; John Murphy, senior vice president, international policy, U.S. Chamber of Commerce; Ken Monahan, director for international trade policy, National Association of Manufacturers; and Robert Brown, chair, National District Export Council. 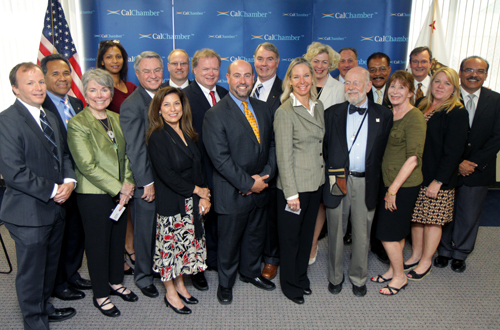 Members of the four California District Export Councils (DEC) meet at the California Chamber of Commerce in Sacramento on May 17, 2016 to hear from Roy Paulson, Former Chair of the National District Export Council and President of Paulson Manufacturing and Judy Rising Reinke, Deputy Director-General, U.S. and Foreign Commercial Service, U.S. Department of Commerce, and attend several international trade-related events. 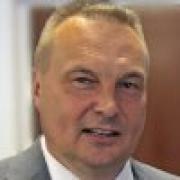 Members of California District Export Councils (DEC) meet in Sacramento on May 27, 2015 to hear from Roy Paulson, Chair of the National District Export Council and President of Paulson Manufacturing, and attend several international trade-related events. Trade Promotion Authority and the re-authorization of the Export–Import Bank, both issues pending in Congress and affecting U.S. / California exports were the focus of a conversation with Antwaun Griffin, Deputy Assistant Secretary at the U.S. Department of Commerce. Front row (from left): Bo Reed, Caterpillar Inc. 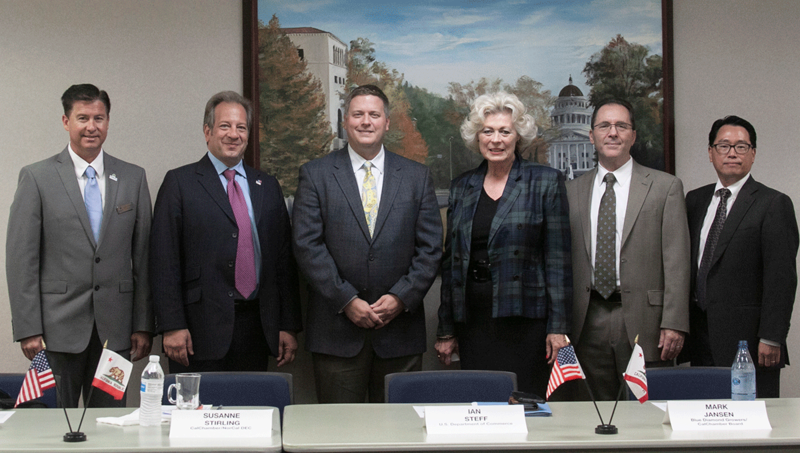 Solar Turbines Incorporated; Ester Gordillo, Sacramento CITD; Theresa Cox, U.S Department of Commerce; Janice Cooper, California Wheat Commission; Roy Paulson, National DEC Chair / Paulson Manufacturing; Susanne Stirling, CalChamber; Jerry Levine; Honorary Consul of Barbados; Donald Sovie, Law Offices of Donald E. Sovie; Jeremy Potash, California-Asia Business Council; Rick Gibbs, Murrieta City Councilmember; Candy Hansen-Gage, Gage Ag Consulting; Back row (from left): George Tastard, U.S. Department of Commerce; Brooks Ohlson, Honorary Consul of Bulgaria / CITD; Jeff Williamson, Center for International Trade Development (CITD); Michael Obermire, USS-POSCO Industries; Deep Sengupta, DSG Global; Jeff Deiss, US Export Assistance Center; Sean Patrick Tario, Open Spectrum Inc.; Sean Randolph, Bay Area Council Economic Institute; Matthew Anderson, U.S. Foreign Commercial Service; Greg Mignano; U.S Department of Commerce. The California Chamber of Commerce was well represented at recent gatherings of export and international trade specialists nationwide in Washington, D.C.
CalChamber Vice President of International Affairs Susanne Stirling attended the 2014 District Export Council (DEC) Forum and the International Trade Symposium, October 1–3. Stirling is a longtime member of the Northern California DEC. Re-elected as chair during the National DEC meeting was Roy Paulson, a​ CalChamber member and longtime member of the CalChamber Council for International Trade (CCIT). He serves on the Inland Empire DEC and is President of Paulson Manufacturing Corporation in Temecula. Another longtime CCIT member, Donald Sovie, vice chair of the Southern California DEC, accepted the 2014 award for DEC of the Year. Three of the four California DECs (including the Inland Empire and San Diego) were among the seven nominees for the award. Arun Kumar (left), Director General of the U.S. and Foreign Commercial Service presents the DEC of the Year Award to the Southern California DEC, received by Vice Chair Donald Sovie​. Welcome remarks by Antwaun Griffin, deputy assistant secretary of the U.S. and Foreign Commercial Service in the U.S. Department of Commerce. He highlighted the National Export Initiative (NEI) “Next”. Launched in May, NEI Next is using improved information and a customer-service strategy to help U.S. companies increase exports. Keynote remarks by Arun Kumar, director general of the U.S. and Foreign Commercial Service (who visited the CalChamber in Sacramento in July). Panel discussions on DEC best practices and exporting best practices. Members of four California District Export Councils (DEC) meet in Sacramento on May 20, 2014 to welcome Roy Paulson, Chair of the National District Export Council and President of Paulson Manufacturing, for several international trade-related events. National policy priorities affecting U.S. and California exports were the focus of the May 21 gathering of the District Export Council (DEC) of Northern California at the California Chamber of Commerce, including special guest Michael Masserman (seated, second from left) of the U.S. Department of Commerce. 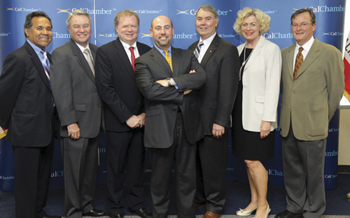 Alert, May 25, 2012At the meeting of the District Export Councils (DEC) of California are (from left): Fred Latuperissa, Tim Murphy, Daniel Ogden, Esq., Paul Oliva, Donald Sovie, Suanne Stirling and Gregory Mignano. From Left to Right, Back Row: Tony Hill, U.S. Department of Commerce; Fred Latuperissa, U.S. Department of Commerce; Deborah Ale Flint, Port of Oakland; Tim Murphy, Comerica; George Tastard, U.S. Department of Commerce; Daniel Ogden, Esq., National DEC; Don Sovie, Crowell & Moring; Susanne Stirling, California Chamber of Commerce; Everett Golden, Otis McAllister; Mike Clark, APT; Greg Mignano, U.S. Department of Commerce; Cesar Lucio, American River Packaging; From Left to Right, Front Row: Jeremy Potash, Cal-Asia; Ester Gordillo, Sacramento CITD; Paul Oliva, Oliva Global Communications; Leslie Levy August, Corporation for International Buisness; Jerry Levine, Mentor International; Candy Hansen Gage, Fresno CITD; and Carol Johnson, Monterey Institute of International Studies. 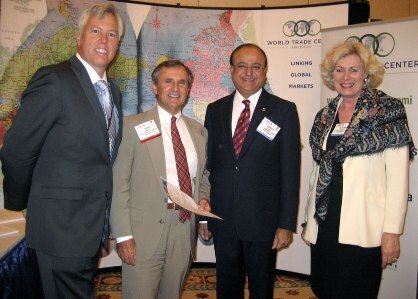 (From left) Richard Swanson, Regional Director – Pacific South, U.S. Department of Commerce; Hugh Constant, Executive Vice President, San Diego World Trade Center; Suresh Kumar, Director-General of the U.S. Foreign Commercial Service; and Susanne Stirling, Vice President International Affairs, CalChamber. (June 1, 2011 in Sacramento, California) Members and Guests of the Northern California District Export Council meet in Sacramento on June 1, 2011 to welcome Kurt Tong, Ambassador to APEC for the United States to Sacramento for several international trade-related events. Pictured are: (Seated from left) Greg Mignano, Candy Gage, Paul Oliva, Steve Glickman. (Standing from left) Jorge Jaramillo, Steve Herrick, Jerry Avila, Sean Randolph, Everett Golden, Susanne Stirling, Michael Obermire, Michael Clark, Carol Johnson, Jerry Levine, Deborah Ale-Flint, Jeremy Potash, Louis Sciupac, George Tastard. 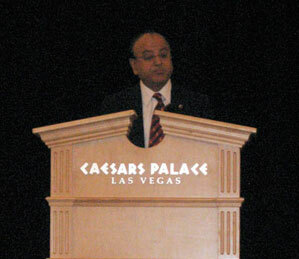 (May 17, 2010 in Sacramento, California) Members and guests of the Northern California District Export Council meet in Sacramento on May 17, 2010 to welcome Suresh Kumar, the newly appointed Director-General of the U.S. and Foreign Commercial Service, to Sacramento for several international trade-related events. Pictured are: (Seated from left) Candy Gage, Susanne Stirling, Janice Cooper and Carol Johnson. 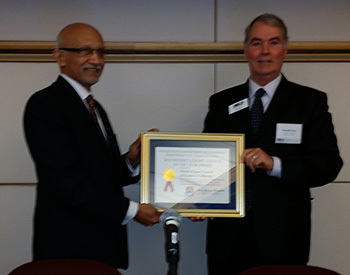 (Standing from left) Janis Lazda, Deep SenGupta, Tony Livoti, George Tastard, Richard Swanson, Paul Oliva, Vladimir Ostrich, Jerry Levine, Sean Randolph, Director-General Suresh Kumar, Ambassador Demetrios Marantis, Jeremy Potash, Everett Golden, Michael Clark, Michael Obermire, Steve Glickman and Greg Mignano.